Compare Popular Laundry Sorters: Honey-Can-Do, Whitmor, Seville Classics or Deco Brothers? If you are in charge of doing the family laundry, chances are you loathe this household chore that needs to be done week after week, specially if your family is large with a number of children. Unfortunately, in most homes, each member of the family simply throws their dirty clothes into one large hamper usually kept in the bathroom or the laundry room, and on laundry day, the person in charge will have to spend quite a bit of time sorting the myriad of accumulated dirty clothes into whites, colors, delicates, etc , before they can be properly washed. One of the neatest tricks in simplifying the laundry task is equipping your home with a laundry sorter instead of a simple hamper. A laundry sorter (shown on the left) is simply a composite hamper equipped with a number of separate compartments that can be used to sort the dirty clothes according to color, required washing temperature, type of material, or any other criteria you may choose. But getting a laundry sorter is not enough. What is also required is a certain level of discipline to be followed by each member of the family. Basically, each and everyone living at home will have to be responsible for dropping their dirty clothing and underwear into the correct bag (or compartment) of the laundry sorter, the choice of which will depend on the sorting rules you will need to establish. An example might be: all whites in the first compartment, all delicates in the second, and everything else in the third. Note that the more compartments the laundry sorter will have, the more sorting rules you will be able to establish. With this method, on the dreaded laundry day, you will already have all the clothes presorted, and not only will you save quite a bit of time, but you will also avoid handling dirty clothes which can be unhealthy. This article will compare four of the most popular laundry sorters bought by Amazon customers. They are Honey-Can-Do SRT-01158, Whitmor 6097-3529-BB, Seville Classics SHE16166 and Deco Brothers CT-002-1. 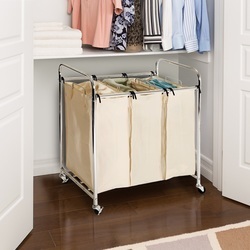 These four laundry sorters were the top sellers in their category at the time this article was written and have received excellent reviews from Amazon customers (an average rating of more than 4 star out of 5 stars for each of them!). Selected Laundry Sorters on Amazon. The following tables compares the selected laundry sorters. Please read the table notes that follow to understand better the features that come with each. Note 1: Note that the more you have bags, the better you can sort your laundry. It is also important that the bags be removable so they can be washed and cleaned. This also avoids moving the whole sorter near the washing machine, if only the contents of one of the bags need to be washed. Note 2: Steel construction enables heavy duty use of the laundry sorter: it will not break or bend under heavy weight. 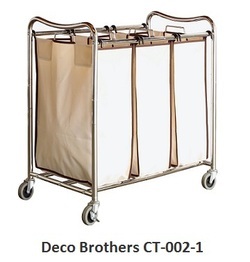 Note 3: Hony-Can-Do and Deco Brothers sorters both have a bottom frame that keeps the bags above the floor. Seville Classics has a wire grid base that provides support for the bags. 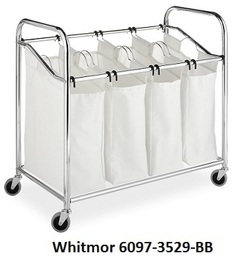 Whitmor sorter does not have a bottom frame, but the bags do not touch the floor when they are full and hanging. Note 4: All four laundry sorters are very easy to roll and move around. Note 5: Locking casters prevent the unit from rolling freely. Note that only two of the wheels lock which is enough to keep the sorter in place. Note 6: All prices indicated here were in effect at the time this article was written and may have changed. For exact prices, please refer to the Amazon products section below. Note that Amazon prices often include a good discount on the List Price. 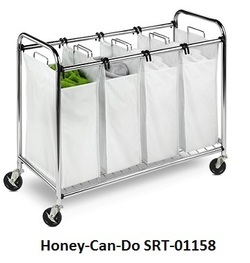 In conclusion, looking at the comparison table above, it's easy to observe that the four laundry sorters selected here all have useful features such as sturdy steel/metallic frames, removable bags, and lockable casters. In terms of capacity, though the bag sizes that come with Seville Classics and Deco Brothers sorters are slightly larger, they only have space for three bags, while Honey-Can-Do and Whitmor sorters are equipped with four bags allowing you an additional way of sorting your laundry. Another consideration that may affect your choice is the material the bags are made of. If you don't like polyester canvas and prefer cotton, then you might want to consider Honey-Can-Do. Note that cotton canvas is easier to wash than polyester which is usually recommended to be washed by hand and with cold water. You will find below on Amazon, all four laundry sorters compared above. Please click the laundry sorter of your choice below for price information or to purchase.